This year the theme is one all New Zealanders can relate to: Ngā Ingoa Māori – Māori names. I am really looking forward to making a concentrated effort to hone my pronunciation of Māori place names – I’ve got over 40 years of mispronunciation to correct! We are well underway with the development of three new Maori Language Week classroom games and resources. And don’t worry, I won’t be voicing the sound track for the pronunciation guide! At the moment we are testing prototypes for the board game – it’s great when you get to play games at work! The board game is being designed to not just help players learn the names of key New Zealand locations in Te Reo Māori, but to provide a geography lesson as well. Plus there will be lots of fun trying to beat the other players to the end goal! 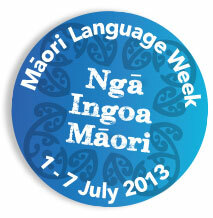 In addition to the board game, we’ll also have two new interactive whiteboard resources for Māori, Language Week 2013. These will help teachers and students with the basics of Ngā Ingoa Māori. The new game and resources will be released, all going well, ahead of Maori Language Week 2013 so teachers and home schooling parents will have plenty of time to organise their lessons for the week. You can now purchase the ‘Aotearoa Road Trip‘ board game. Check it out here.